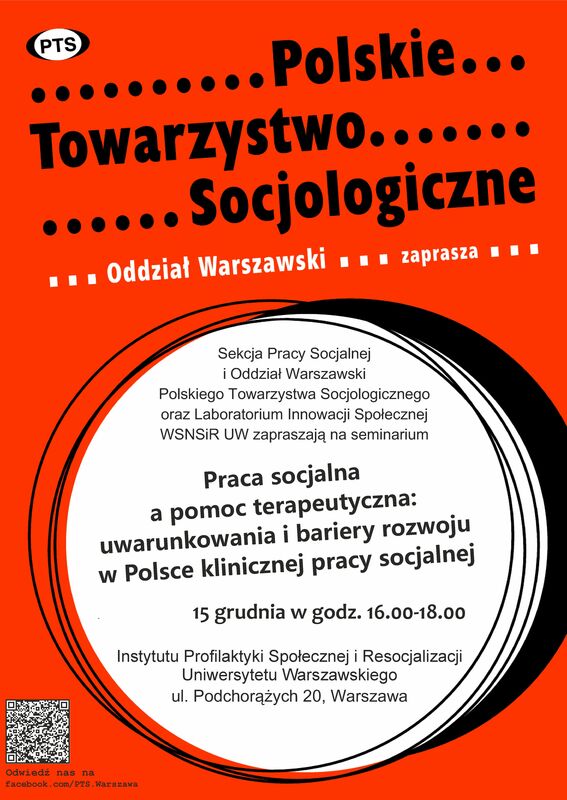 Section of Social Work was formed in 1995 as the initiative of Cracow sociologists of the Institute of the Sociology of Jagiellonian University, most of all by Władysław Kwaśniewicz and Krzysztof Frysztacki. Rapid development of social workers education on the academic level, as part of the sociological college from the end of the eighties of the 20th century and thorough transformations in the Polish social policy and the welfare after 1989, created the need of reinforcing associations between sociology as field of science and the public practice. The foundations of the Section were caused by the need of building institutional frameworks for all interested in scientific aspects of social work – also coming from outside the academics environment – and to the need of inspiring scientists to the deeper interest with issues related to the social work and the welfare. From its first moments the Section actively operates on the field of integrating all persons and groups interested in the social work and creating basis of discussion and exchange of experiences. The members belong both to various scientific and research environments, and those who do the social work. The most important Section members’ factors are among others: a discourse concerning positioning of social work and welfare in the social policy system, and the issue of educating the social work in Poland; as well as the problem of effectiveness of selected means and preferred methods. The Section was forming dedicated groups as part of Polish sociological conventions; and almost from its beginning was also initiating annual conferences and scientific seminars devoted to various aspects of the social work. Many publications were published due to the Section activity, inspired with discussions that are taking place on its forum, most of all in the book series “Problems of the Social Work of the Educational Publication” with significant Section members’ contribution. At present the Section of the Social Work is consisting of over 100 members and belongs to the most active dedicated sections in the Polish Sociological Society. The very first Section chairman was Prof. Krzysztof Frysztacki from Jagiellonian University of Cracow, and his successor Prof. Krzysztof Piątek stayed with UMK in Toruń, and at present Division is supervised by Prof. Kazimiera Wódz from University of Silesia in Katowice.